Ahmir “Questlove” Thompson likes music criticism. A lot. Throughout the length of his impressively arch, anti-formulaic pseudo-autobiography, he nearly spends more words on the subject of music criticism than the art form itself. As a kid, he grew up worshipping not just records, but the reviews of those records. Basically, he was part of the first generation of omnivorous music nerds, the kind of which now rule the insanely divergent cultural mass that we call the internet. As a musician, writer, and curator, he was made for these times. 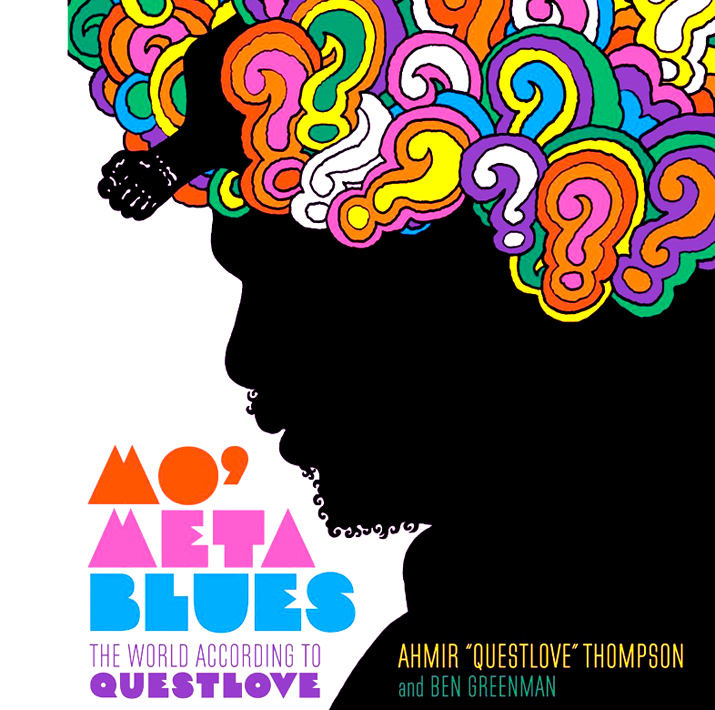 The book begins with a tone-setting exercise where Questlove is having a strange, probing, circular conversation: it may be with himself, or with his manager Richard Nichols (who appears throughout the book as a foil to embody Quest’s self-reflections). He immediately launches into a digression about the overall objective and structure of music biographies. The question he’s asking is, “if I’m going to do this, how can I do it differently?” That drive to self-examine, and his obsession with the critical dialectic, is really the theme of this entrancing book. Since you can get the biographical details from anywhere, I’ll not recount them at length here. But suffice to say, Questlove grew up as a true show-biz kid, with all that implies. His dad was a minor-league doo-wop singer who toured nightclubs with his own revue-style band, with enough success to sustain his family in the early years. His father’s career and opinions on music loom large in Questlove’s professional life. His dad disapproved of hip hop, and he actively discouraged his son from any musical pursuit that didn’t lead to a career as a session drummer. As a result, hip hop became Questlove’s equivalent of punk rock: the rebellious and self-destructive art form which allowed him to carve out his own identity. The tension in the family around listening habits was palpable, to the point where young Quest was forbidden to listen to certain musicians around the house, most notably Prince and his stable of sexually-charged artists. This dynamic seems to have set the tone for Questlove’s career. For the rest of his life, he seems fixated on his sense of inferiority, of not being able to please everyone. Structurally, the book makes an admirable attempt to circumvent the traditional musician bio narrative arc (I say attempt because that formula can only be stretched so far). The early chapters are packed with giddy remembrances of the first time he heard his favourite artists (Stevie Wonder, Prince, The Ohio Players), and playlists where he reveals his burgeoning love of obscure songs and off-beat choices. But at the story progresses, this gives way to personal anecdotes about his career with the Roots and they challenges that they’ve faced as “the last hip hop band on Earth”. He’s a thoughtful writer and he is able to draw a larger cultural frame around his band, deftly tracking changes in musical trends and the shifting political climate of America over the last ten years. Nichols pops up at times to ad colour to the narrative or argue with Quest, which is entertaining and helps break up the story into more philosophical components. As one would expect with someone like Questlove, when it comes to great musical works, the devil is in the details. He gushes about his love of subtle drum effects, vintage equipment, and deceptively simple beats. As a young music listener, he immediately focused on the small sonic touches that defined the great records of the Seventies. For him, Stevie Wonder’s meticulous productions were a revelation, an endless sonic filigree filled with glittering musical gems. His early attention to those small things has helped make him the premier drummer and producer that he is today. Another tome could be written about his drum technique and production styles. He represents an alternative voice in the world of professional drummers, one not motivated by egotistic flashiness or technical prowess, but by a submission to the almighty power of the groove. With the sheer number of musicians that have spent time in his orbit, you’d think that his book would contain some real gossip or behind the scenes anecdotes, but there’s surprisingly little of that. Although the Roots are the subject of much of the book, there are very few details about their internal dynamics or the personalities of their membership. He does explore his relationship with Black Thought quite a bit, in particular the differences in their social and family backgrounds and how those factors have shaped them as men. But I’m sure an illuminating story could be written about the rest of the band as well. Dozens of people have been a part of this group over the years, but the evolution of the lineup is not discussed in any in-depth way. I’m sure he wanted to protect his friends, so I understand his urge not to sensationalize their lives. What he writes about instead is the way the band is perceived by their peers and the mainstream press. This brings me back to my earlier point about his obsession with the critical process. Questlove makes no secret of the fact that he loves reviews almost as much as the music itself. He says that when he hears about a new group, the first thing he does is go online to take the temperature of their critical response. He says that when he’s making a record, he’s already writing the review in his head. And in reality, this is the main subject of the book. This is the story of a man who is reviewing his life as if it were an album, and reviewing his reviews. Questlove has been a professional musician since he was 8 years old, and by all accounts he has had a remarkable career. So it made me a bit sad that he’s still so obsessed with how the world perceives him. I struggled to understand why the “Bentley moment”, as he calls it, is so important to him. He’s clearly a sensitive, intuitive guy, and his relationship with his family is conflicted at best, so perhaps his adult life has been a form a self-protection or compensation. He says The Roots were always “bridesmaids”, which I think is a little bit disingenuous. In his dissection of the factors which ensured that the Roots were never as big or as successful as their friends and contemporaries, I did feel a bit of a whinge. I wanted him to be above all that. He’s a rich, professional musician with the most stable talk show gig imaginable, and millions of fans besides. Why should he care what Pitchfork thinks of his work? Why does it bug him so much that the Fugees became stars, or that Kanye has become the biggest artist of our time? Of course, in a field that values peer respect the way that hip hop does, it’s easy to see how these questions can become crippling. But by becoming a musical institution, a pillar of cultural criticism, and a great writer, Questlove has already won. He just didn’t know which game he was playing. This entry was posted in Blog and tagged 1970s, 1980s, 1990s, 2000s, art, biographies, books, composers, drummers, entertainment, Hip Hop, History, Music, music industry, Page Tuner, Questlove, Rap, Stevie Wonder, The Roots by audioreckoning. Bookmark the permalink.